Nicole Zhang, the Balboa Spring Championship at Balboa GC. Nicole, shot 76 (+3) to win by a shot over Tiffany Pak’s, 77. Nicole, posted a +3 over par 41 on her opening 9 hole’s. She responded well on the back side with an even par 35, to win the Balboa GC Championship. Nicole has been working hard with her coach, to put the club position at the top in a better position and to keep the club, on plane throughout the golf swing. The freshman from Pacific Academy, Irvine, CA., is working to qualify for the Toyoto Tour and the AJGA. Alesia Barry, Westlake Village, CA., shot a 49 and finished in 4th place in the Girls 9-11 Division. 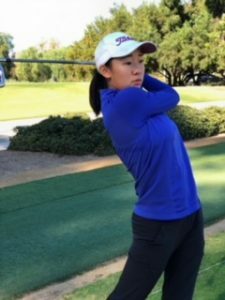 Sophi Lee, Los Angeles, CA., won the JDT Spring Championship @ Rancho Park Par 3. Sophi, won her first JDT event with a 33 on the par 27 golf course. Sophi won a cardoff with Kara An who also shot a 33. Sophi’s birdie on the 9th hole was the deciding factor in Sophi, winning her first event. 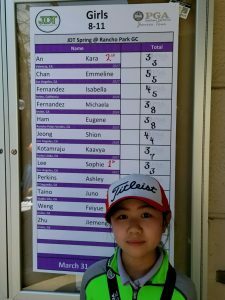 Bella Yang, finished in 6th place with an 81, in the Upland Hills Spring Championship, at Upland Hills Country Club. Bella, had 3 double bogies, 6 bogies and a lone birdie in her round. Bella, has been working on how to take her “lesson swing” with her when she finishes her lesson. 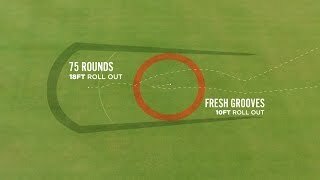 Many player’s will have a good swing in the lesson, but are unable to take the swing from the lesson, back home to their home range and finally to the golf course. Consistency is the key to better performance. Congratulation’s to Nicole and Sophi for their win’s over the weekend. Big “O” (Oliver) Lee, finished in 2nd place with a 40 in the JDT @ Rancho Park. Oliver compete’s in the JDT Boy’s 5-7.